A nice cold noodle salad ranks pretty high on my list of perfect summer food. It's an easy salad to put together, and it can be prepared several hours before serving. I've been pretty busy lately with several projects and in those times the go-to meals are always the ones I turn to. This salad is versatile (you could use different peppers, mango, slithers of cucumber or grilled chicken if you don't have red pepper or peas) and you could also serve it warm. I served it with a medium rare sliced steak which made for a really nice meal. For me, summer is all about traveling and eating great food with great company. With those ideals in mind, I am headed to San Francisco very soon. San Francisco would probably be the one place on the West Coast that I could picture myself living in. Being quite fair skinned and not the best camper when it's really warm, San Francisco was the perfect choice for a birthday celebration trip. I will be making the - in my opinion mandatory - trip to Alice Walters' Chez Panisse and have a list of restaurants, bakeries and taco joints I can't wait to try out. Life is good! In a small bowl, whisk the soy sauce, rice wine vinegar, sesame oil and fish sauce. Reserve. Cook the noodles according to package instructions. Drain, and lightly drizzle with some canola oil to prevent the noodles from sticking. Reserve and let cool. Transfer the cold noodles to your serving bowl. Add the diced red peppers, scallions, peas and sesame seeds. Dress with the soy marinade and stir. Serve cold or at room temperature. Enjoy! I love those coloured bowls you are using, did you get them at Zone? I have never been to san fransisco, but if I did go I would put a flower in my hair. Happy Birthday and have a great trip! Coco Bean: Yes, they re from Zone! Did you see them there? I'm leaving in a couple weeks, I can't wait! Lovely photo as always. I hope you have an awesome trip! We were just there and I always want to move there when I visit. The food scene is unbelievable. Dana: Thank you! Do you recommend any places in particular to go eat/see in San Francisco? What a lovely summer salad! Happy birthday and have a wonderful trip to San Francisco! I love soba recipes and collect them greedily. I can't wait to give this one a shot! Mmmmm!Healthy and cool, this is the perfect summer meal. Sounds like a wonderful summer! Can't go wrong with soba noodles salad. Lovely, healthy, quick and spring-y! And I love your bowls, they're so cute! Soba noodles any which way work for me. I love them cold, too, so this looks like a perfect recipe for me. Thanks. unconfidentialcook: I hope you get to try it out. 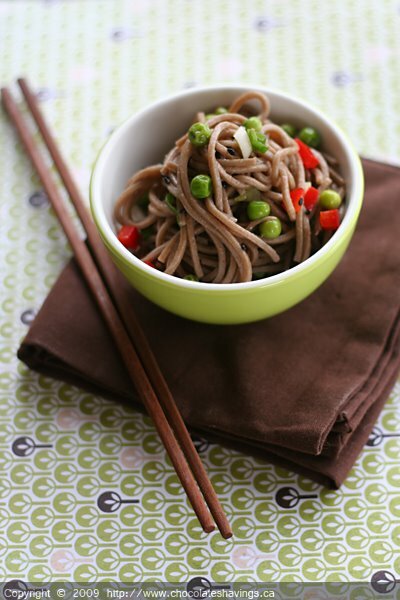 A bowl of cold soba noodles on a hot summer day really is the perfect savory treat! I love soba noodles--I know I should branch out and keep different kinds of noodles in my pantry, but soba noodles are just so versatile. Cold is the way to go in the summer for sure. Few things hit the spot on a warm summer day quite like cold soba- This sounds like a wonderful variation on a classic preparation. Now, I must go stock up on soba! That looks delicious, so refreshing! Love soba noodles. Just bought some organic soba at the market. Have fun in S.F. Cold food on hot summer days are awesome. I <3 bibimgooksoo too! Since you're going to SF, would <3 to give you my food itinerary. I literally ate at 5-6 places every day! And going back for more soon! Enjoy your trip! Ian and I would love to have a food-lover in Montreal rendez-vous! Let me know when you get back and we will set something up! as a strange coincidence I cooked something similar tonight, and I have to say yours looks a ton better. Love the colors and flavors! I love San Francisco! I've only ever been there once (it's a bit far from here..lol) but I thought the atmosphere and everything about it was really nice. So many different areas in one town. Loved it! Maybe you're already there right now in which case I hope you're having a great time! I love SF. Have fun! Your noodle salad looks so refreshing, healthy and energizing! yum! I've been looking for a recipe for soba, I love it and I know it is easy, but this post has given me the power to actually do it! I'm headed to san fran as well, what did you like? Since you already know, I like your recipes, just wanted to tell you that I made this dish last week and it was amazing! Thank you so much for the recipe, it is one we will be enjoying again and again! Jeremy: I'm glad you enjoyed it, it's really become one of my favorite summer salads! Noodle salad is something I make on a weekly basis, including in the winter. It just is something I enjoy eating whether for lunch or dinner. This looks like a delicious recipe. Going to have to try this. I picked the worst time of day to be navigating through food blogs at the end of my day. Going to have to try out this recipe. It looks and sounds really delicious. I know the year isn't usually your cold salad kind of year, but I always seem to be slightly odd when it comes to when I eat certain foods.